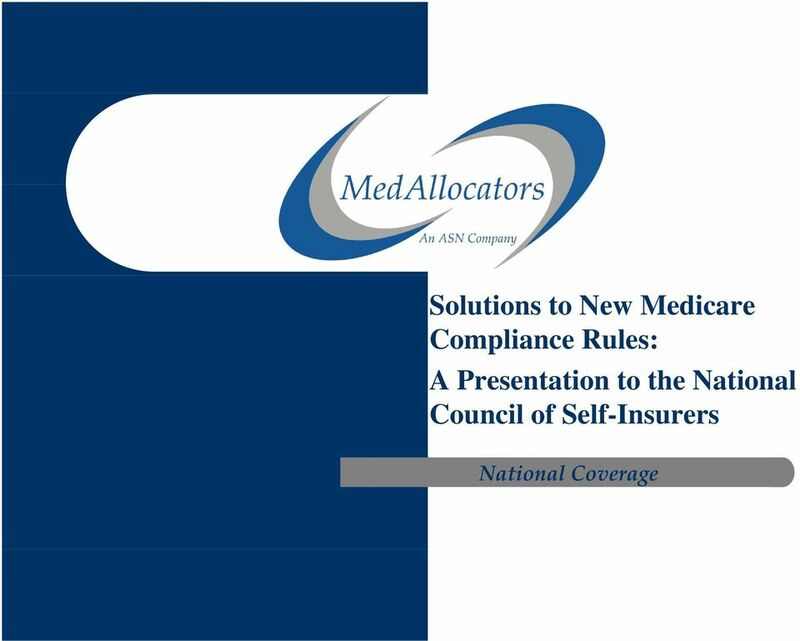 Download "Solutions to New Medicare Compliance Rules: A Presentation to the National Council of Self-Insurers. 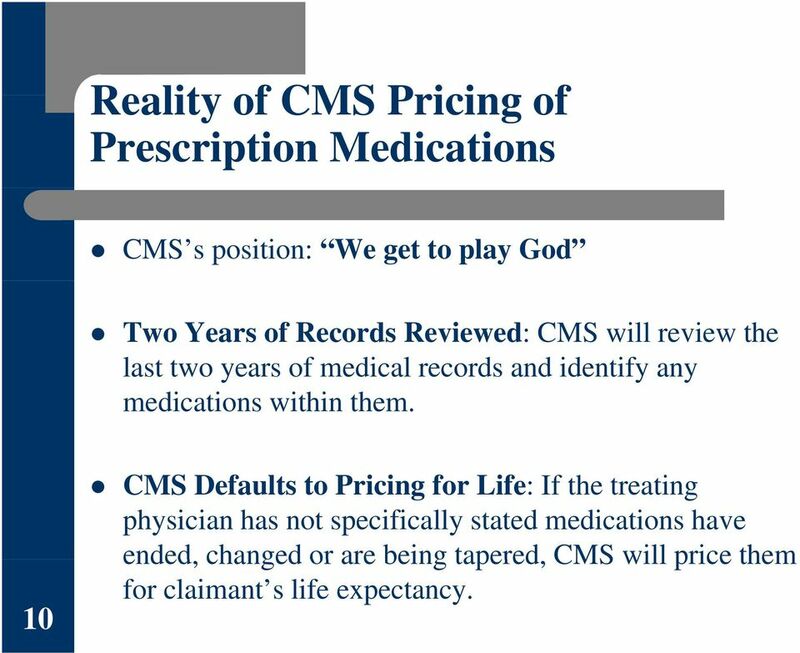 National Coverage"
10 Reality of CMS Pricing of Prescription Medications CMS s position: We get to play God Two Years of Records Reviewed: CMS will review the last two years of medical records and identify any medications within them. 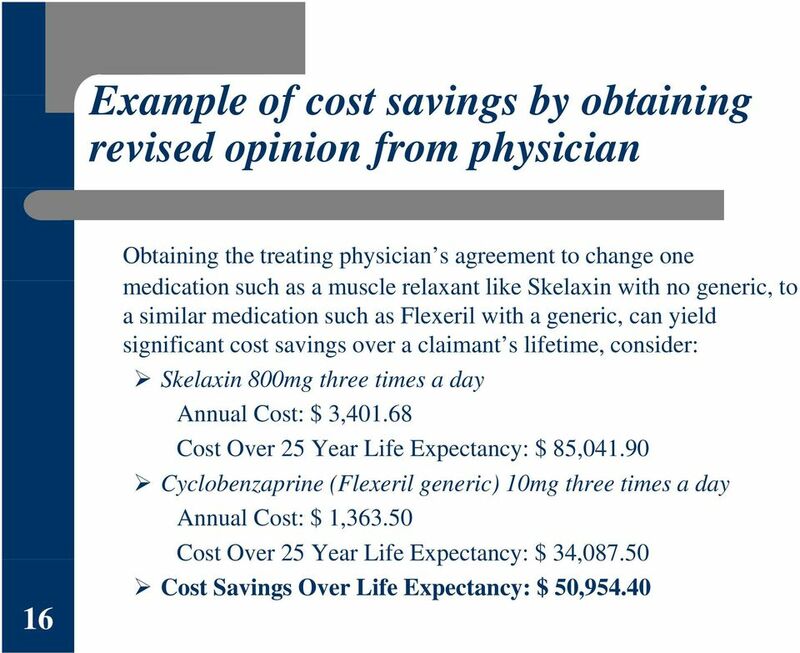 10 CMS Defaults to Pricing for Life: If the treating physician has not specifically stated medications have ended, changed or are being tapered, CMS will price them for claimant s life expectancy. 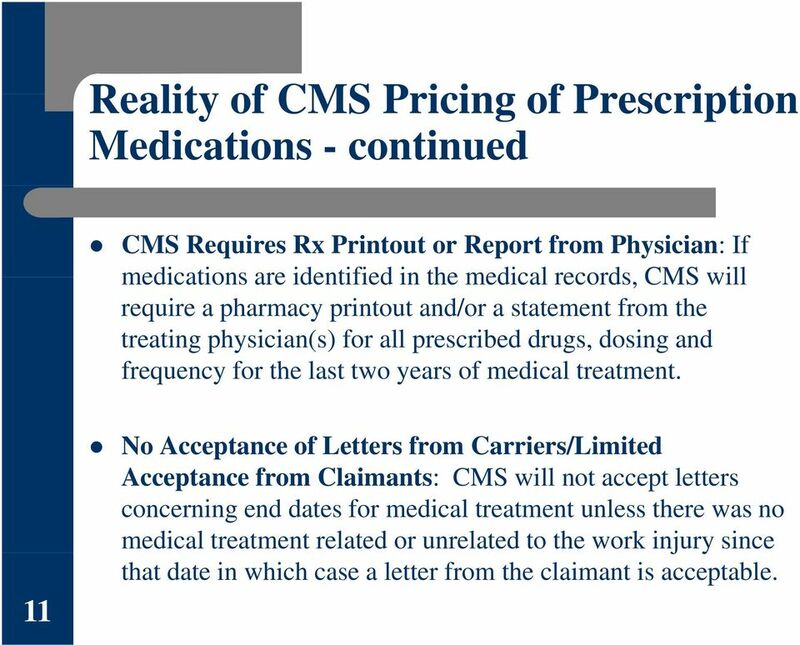 11 Reality of CMS Pricing of Prescription Medications - continued CMS Requires Rx Printout or Report from Physician: If medications are identified in the medical records, CMS will require a pharmacy printout and/or a statement from the treating physician(s) for all prescribed drugs, dosing and frequency for the last two years of medical treatment. 11 No Acceptance of Letters from Carriers/Limited Acceptance from Claimants: CMS will not accept letters concerning end dates for medical treatment unless there was no medical treatment related or unrelated to the work injury since that date in which case a letter from the claimant is acceptable. 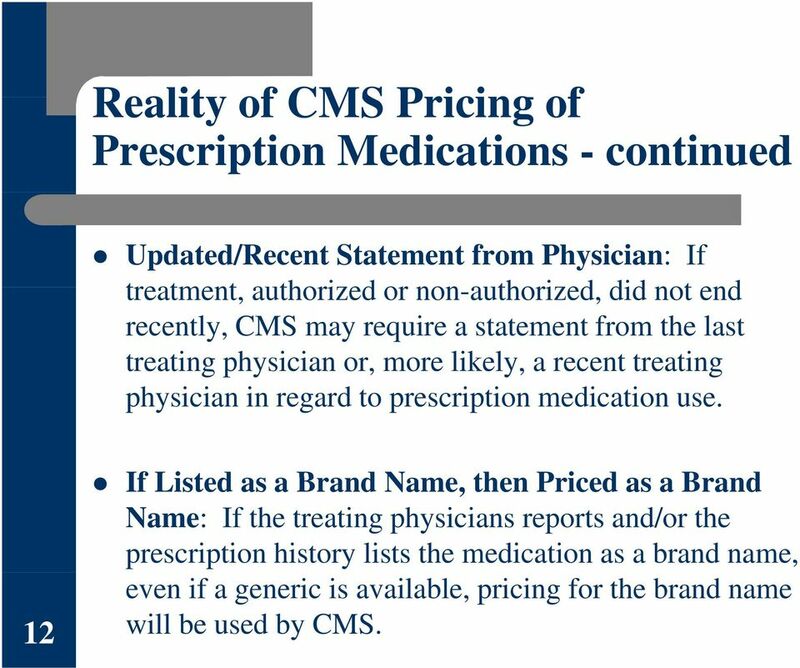 12 Reality of CMS Pricing of Prescription Medications - continued Updated/Recent Statement from Physician: If treatment, authorized or non-authorized, did not end recently, CMS may require a statement from the last treating physician or, more likely, a recent treating physician in regard to prescription medication use. 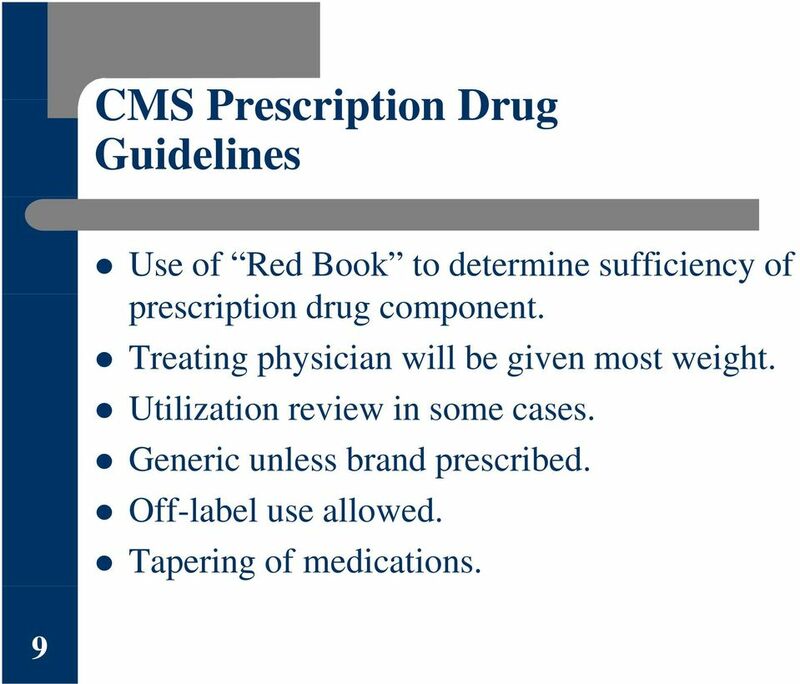 12 IfLi Listed as a Brand dname, then Priced as a Brand Name: If the treating physicians reports and/or the prescription history lists the medication as a brand name, even if a generic is available, pricing for the brand name will be used by CMS. 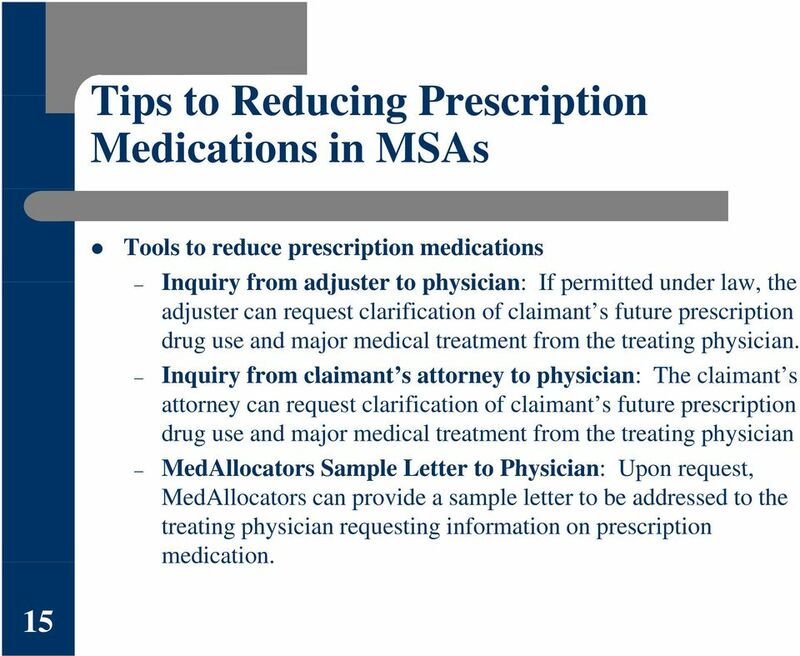 13 Reducing Prescription Medications in MSAs 13 Identify prescription medications Review the same records CMS will review: Review the last two years of medical records, prescription printouts, and any more recent medical records even if for unauthorized or disputed medical treatment. 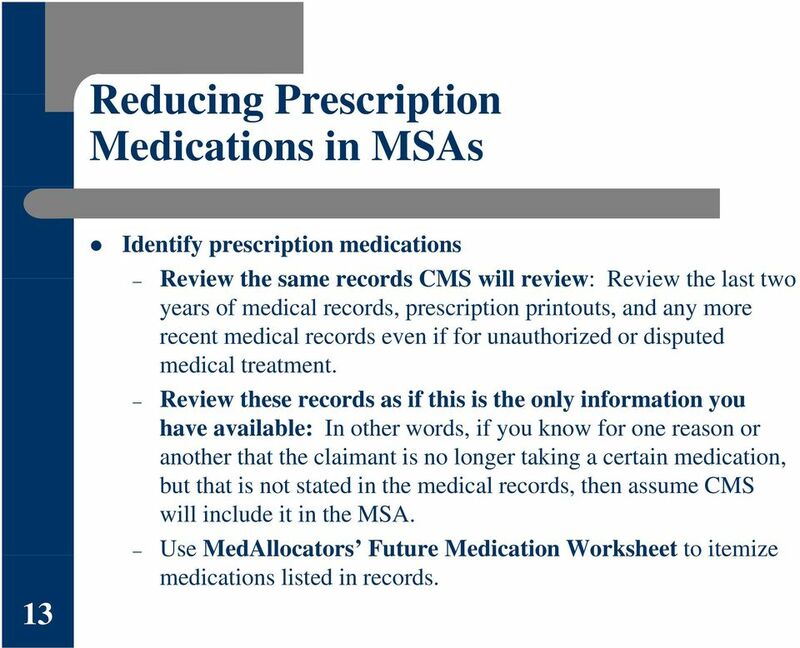 Review these records as if this is the only information you have available: In other words, if you know for one reason or another that the claimant is no longer taking a certain medication, but that is not stated in the medical records, then assume CMS will include it in the MSA. Use MedAllocators Future Medication Worksheet to itemize medications listed in records. 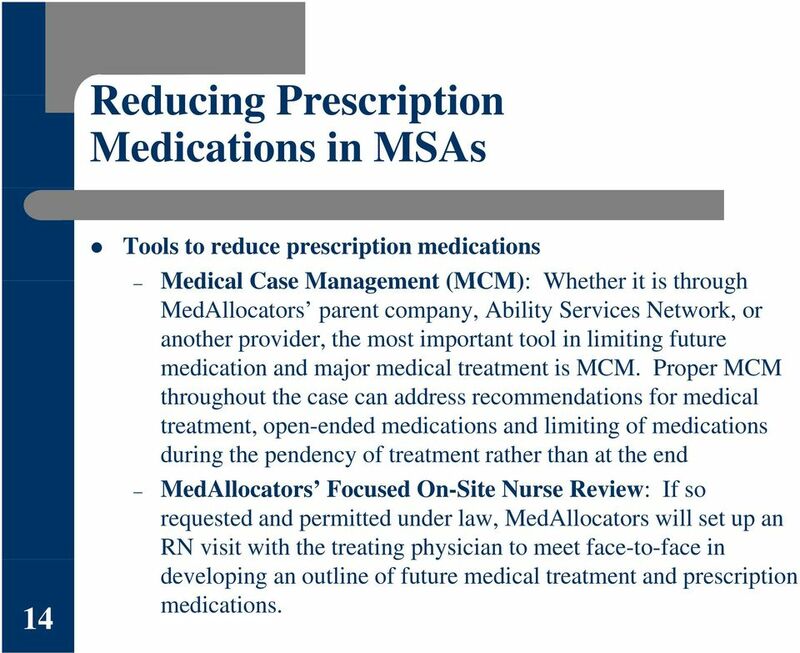 14 Reducing Prescription Medications in MSAs 14 Tools to reduce prescription medications Medical Case Management (MCM): Whether it is through MedAllocators parent company, Ability Services Network, or another provider, the most important tool in limiting future medication and major medical treatment is MCM. Proper MCM throughout the case can address recommendations for medical treatment, open-ended medications and limiting of medications during the pendency of treatment rather than at the end MedAllocators Focused On-Site Nurse Review: If so requested and permitted under law, MedAllocators will set up an RN visit with the treating gphysician to meet face-to-face in developing an outline of future medical treatment and prescription medications. 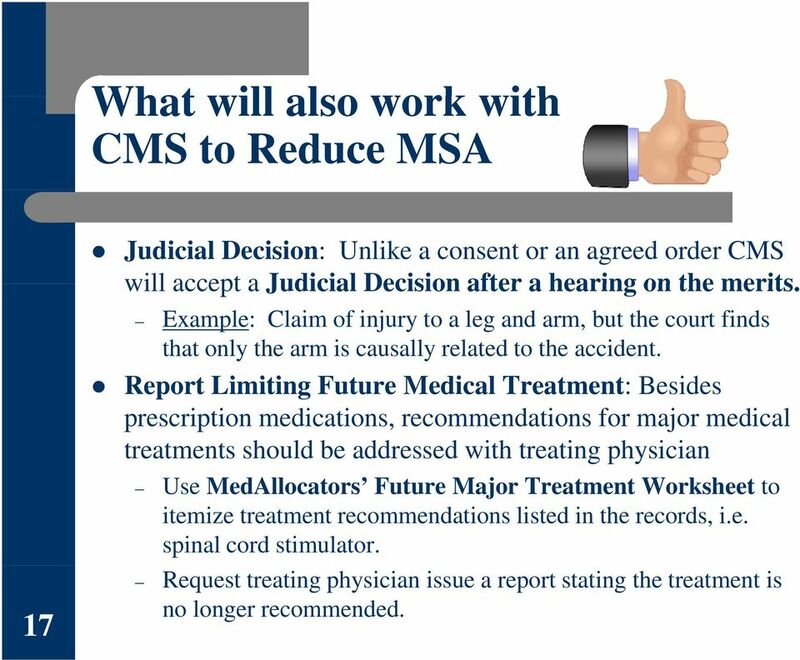 17 What will also work with CMS to Reduce MSA 17 Judicial Decision: Unlike a consent or an agreed order CMS will accept a Judicial Decision after a hearing on the merits. Example: Claim of injury to a leg and arm, but the court finds that only the arm is causally related to the accident. Report tlimiting iti Future Medical ltreatment: t Besides prescription medications, recommendations for major medical treatments should be addressed with treating physician Use MedAllocators Future Major Treatment Worksheet to itemize treatment recommendations listed in the records, i.e. spinal cord stimulator. Request treating physician issue a report stating the treatment is no longer recommended. 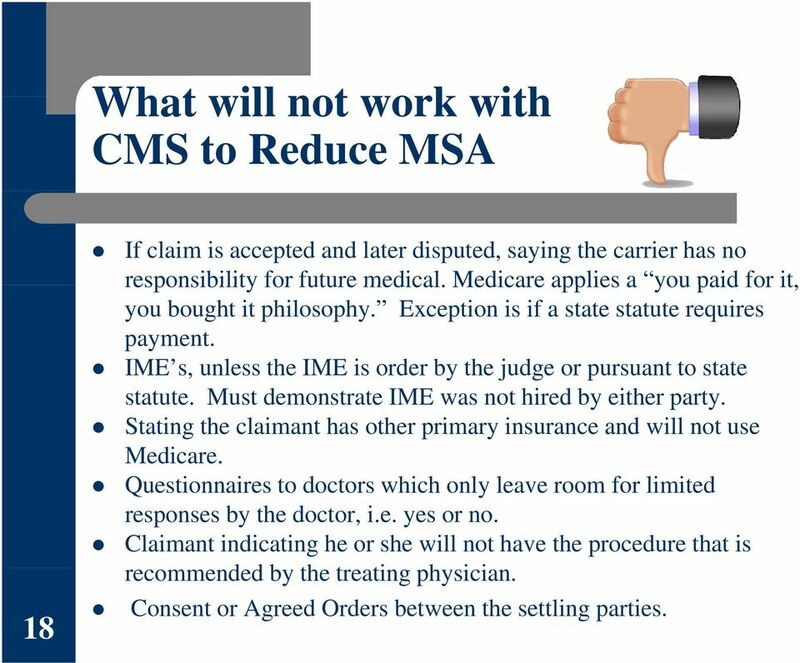 18 What will not work with CMS to Reduce MSA 18 If claim is accepted and later disputed, saying the carrier has no responsibility for future medical. Medicare applies a you paid for it, you bought it philosophy. Exception is if a state statute requires payment. IME s, unless the IME is order by the judge or pursuant to state statute. Must demonstrate IME was not hired by either party. Stating the claimant has other primary insurance and will not use Medicare. Questionnaires to doctors which only leave room for limited responses by the doctor, i.e. yes or no. Claimant indicating he or she will not have the procedure that is recommended ddby the treating ti physician. ii Consent or Agreed Orders between the settling parties. 19 Submitting to CMS prior to settlement Submitting Early: If the case meets CMS review threshold requirements, we recommend submitting the matter early to CMS. Provides parties with the approved MSA amount prior to settlement. Can expedite settlement of case. 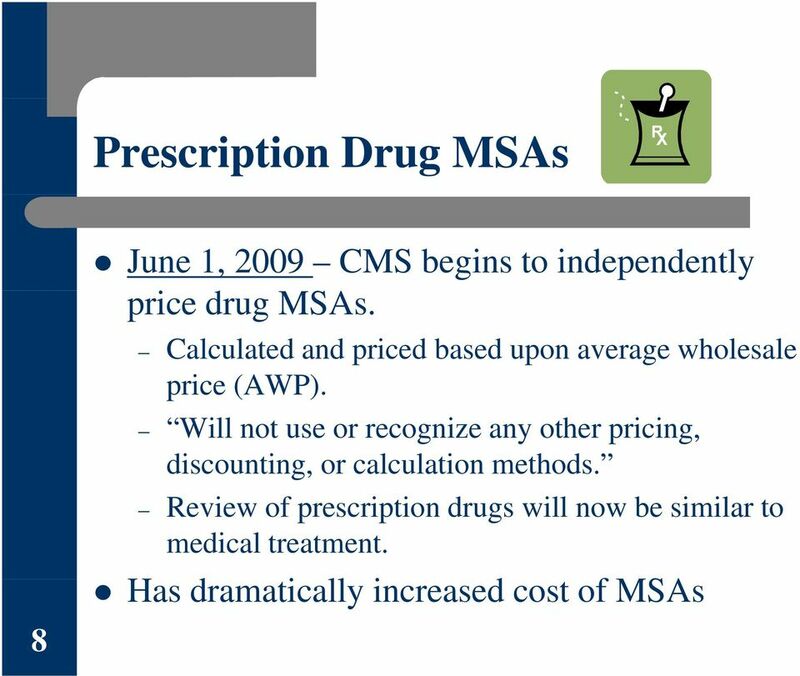 Once CMS approves the MSA, the approval letter does not expire. 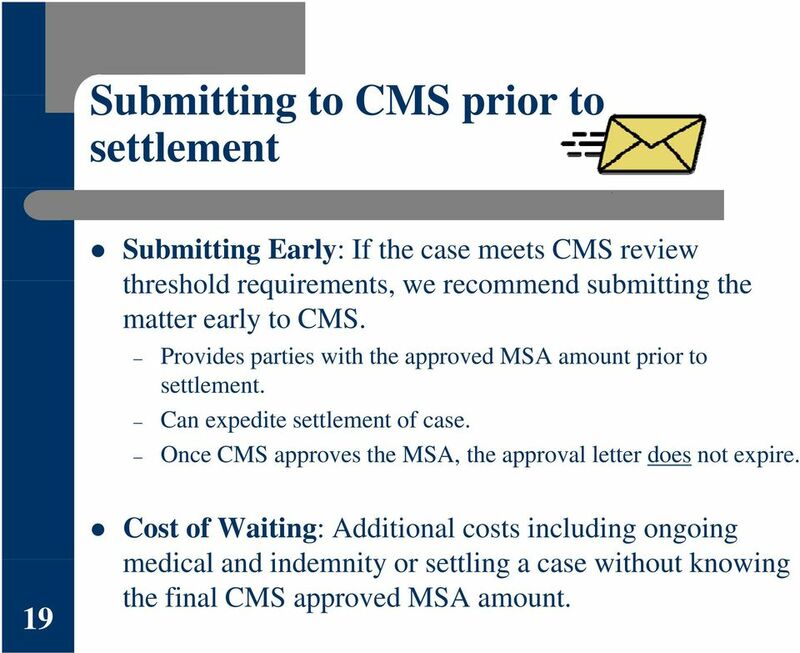 19 Cost of Waiting: Additional costs including ongoing medical and indemnity or settling a case without knowing the final CMS approved MSA amount. 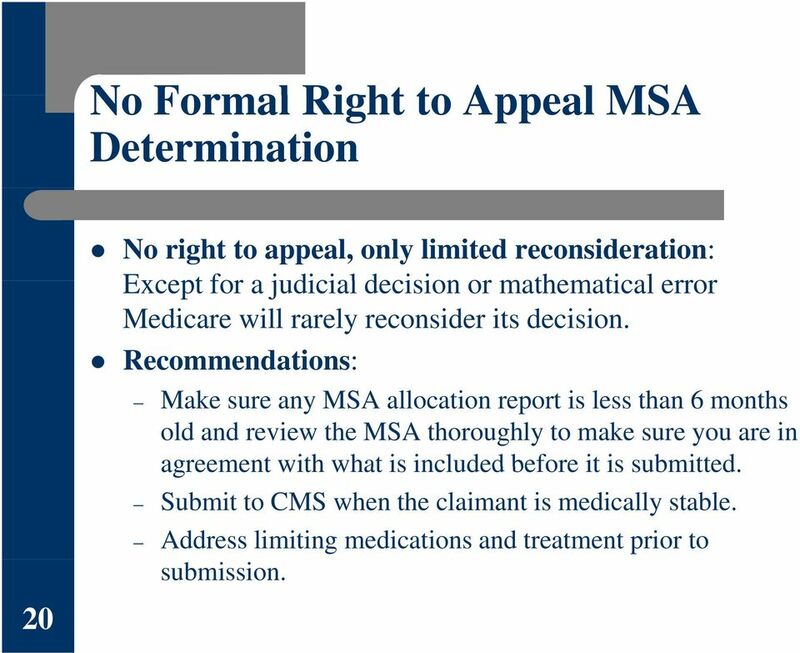 20 No Formal Right to Appeal MSA Determination 20 No right to appeal, only limited reconsideration: Except for a judicial decision or mathematical error Medicare will rarely reconsider its decision. Recommendations: Make sure any MSA allocation report is less than 6 months old and review the MSA thoroughly to make sure you are in agreement with what is included before it is submitted. Submit to CMS when the claimant is medically stable. Address limiting medications and treatment prior to submission. 23 Medicare Lien Evaluation and Resolution Report case to Coordination of Benefits Contractor (COBC) CMS states a conditional payment itemization will automatically be generated and sent to claimant and insurance carrier Alternative #1: Insurance carrier can directly contact MSPRC and request itemization Alternative #2: A vendor such as MedAllocators can request the itemization with an Authorization to Represent form signed by client. Upon receipt of itemization of conditional payments review to determine whether there are any entries unrelated to the injury. If necessary, submit challenge to MSPRC of unrelated entries. * If MSPRC agrees, it will respond with a revised itemization. 23 *A challenge of the itemizations or a request for a compromise or waiver may require a completed Proof of Representation form be submitted to MSPRC. 24 Medicare Lien Evaluation and Resolution If possible, request presettlement compromise of Medicare conditional payments Upon settlement, notify MSPRC and request final demand letter Pay Medicare lien within 60 days of final demand letter If possible, request post-settlement compromise or waiver of fmedicare lien If CMS agrees to the compromise or waiver the amount paid on the lien will be refunded d 24 MedAllocators Medicare Lien Evaluation MedAllocators can investigate and review a conditional payment itemization with a completed Authorization to Represent from the client. MedAllocators can further challenge conditional payments or seek compromises and waivers with a completed Proof of Representation signed by the claimant and our client. 25 Consequences of Failing to Consider Medicare in Settlement 25 Medicare seeks reimbursement from primary payer, such asinsurerorselfinsurer self-insurer. 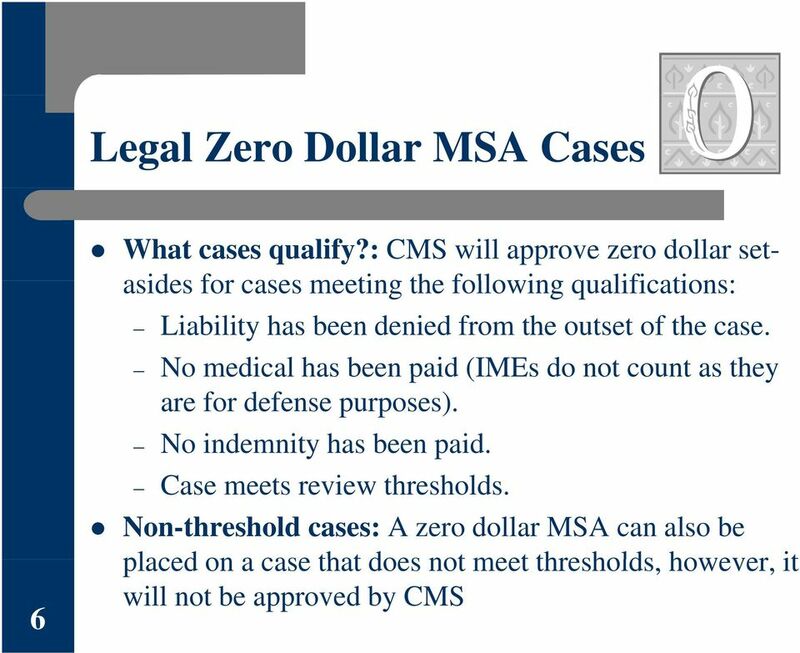 Can seek double damages if suit is brought Medicare seeks reimbursement from entities receiving funds from settlement such as claimant or claimant s attorney. Nothing, if no conditional payments were made and the claimant never again seeks treatment related to the injured body ypart. Medicare denies future injury-related treatment to the claimant. 28 Mandatory Reporting Overview 28 Responsibility for reporting: This rests with what Medicare terms Responsible Reporting Entities (RREs). Generally the RRE is a self-insured company or subsidiary or the insurance company. It is not a third party administrator (TPA). Who does the reporting? : The RRE can do it in-house, assign to a TPA or assign to a vendor. Penalty: $1,000 per day, per claimant penalty for not properly p reporting. 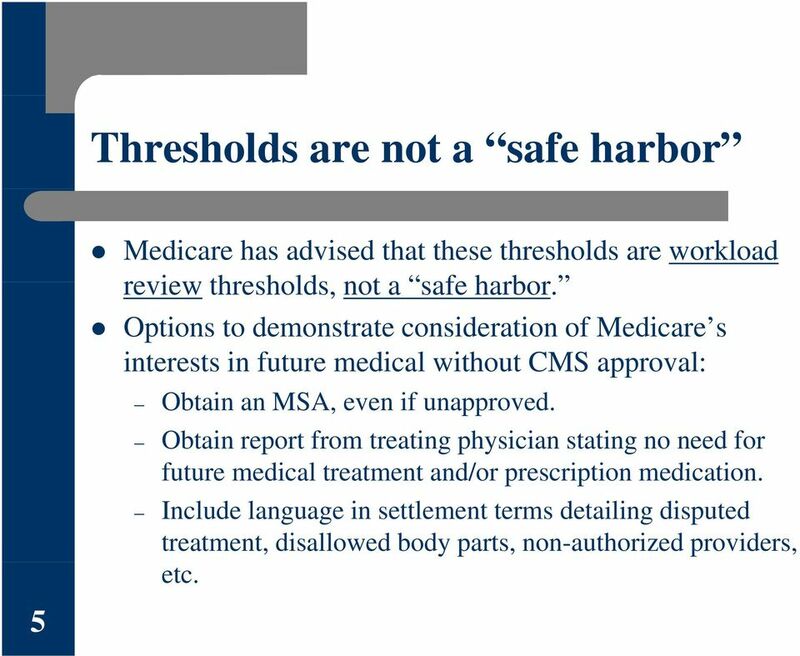 MSAs: Section 111 reporting requirement does not discuss Medicare Set-Asides. 29 Mandatory Reporting Timeline - Updated 29 RREs must register by 9/30/09. By 12/31/2009 the RRE must have a system in place to report files. Between 1/1/2010 and 3/31/2010: Mandatory testing period for files. (Has now been continued until the end of 2010). 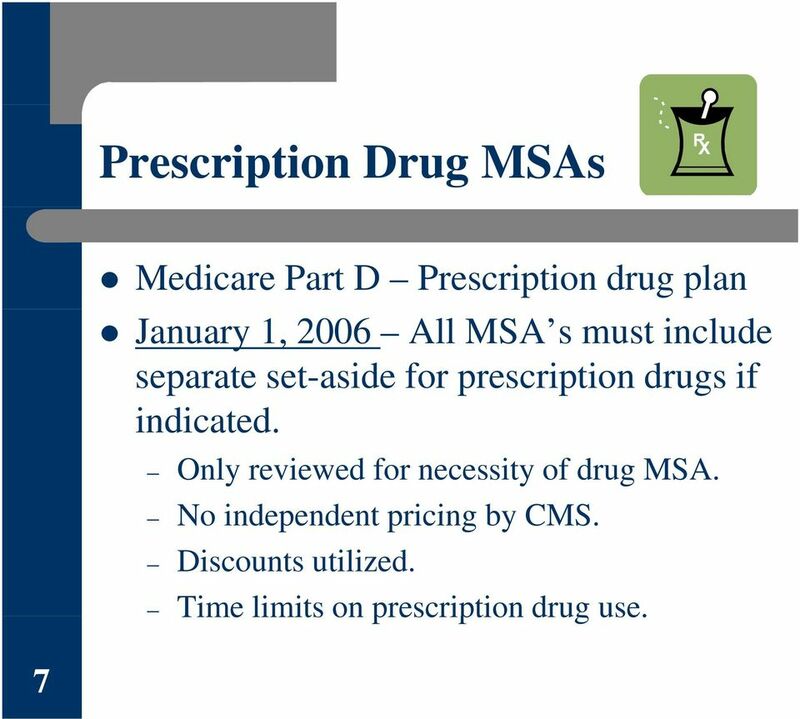 Between 4/1/2010 and 6/30/2010: First actual submissions made based upon a schedule determined by Medicare. (Has now been continued until 1/1/2011 3/31/2011). ) Subsequent reports will be made on a quarterly basis. 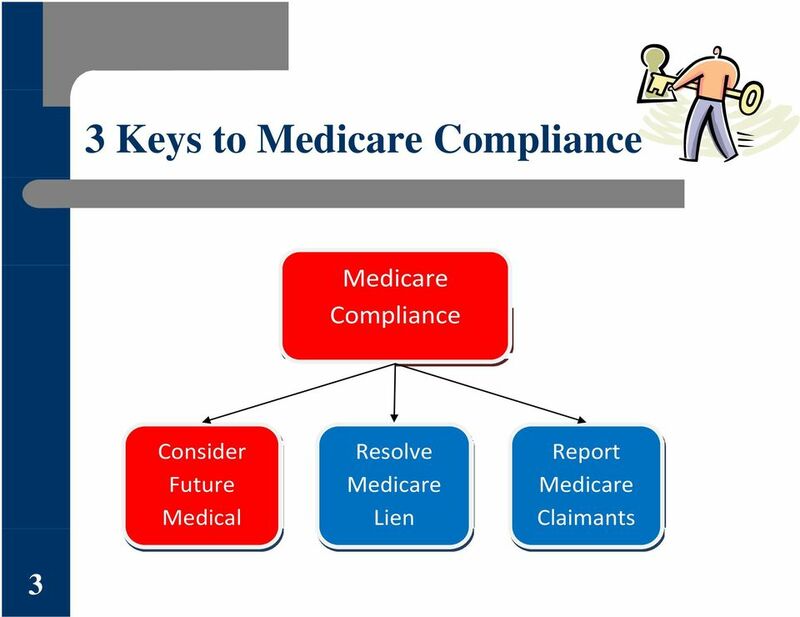 32 Strategies for complying with Medicare 32 1) Identify claims with Medicare and/or SSDI beneficiaries 2) Formulate a plan to consider future medical under the MSP: 1) Put practices in place to limit future treatment and Rx 2) Does the claim meet review thresholds? 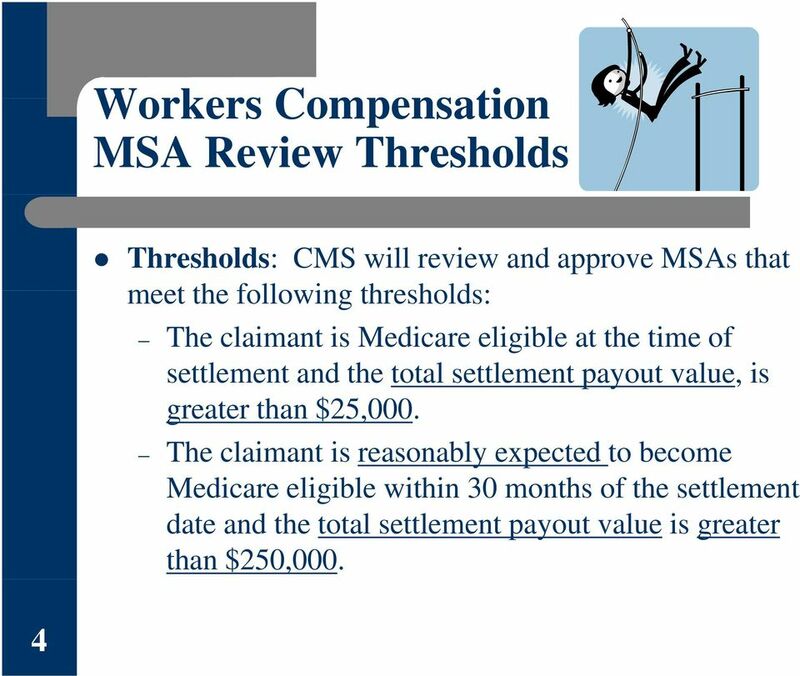 3) Obtain MSA prior to settlement and review and discuss it 4) Submit and obtain approved MSA prior to final settlement. 3) Formulate a plan to investigate and resolve Medicare liens: 1) Challenge conditional payments unrelated to injury. 4) Formulate a plan for complying with Section 111 reporting: 1) How is information to be gathered from claimants? 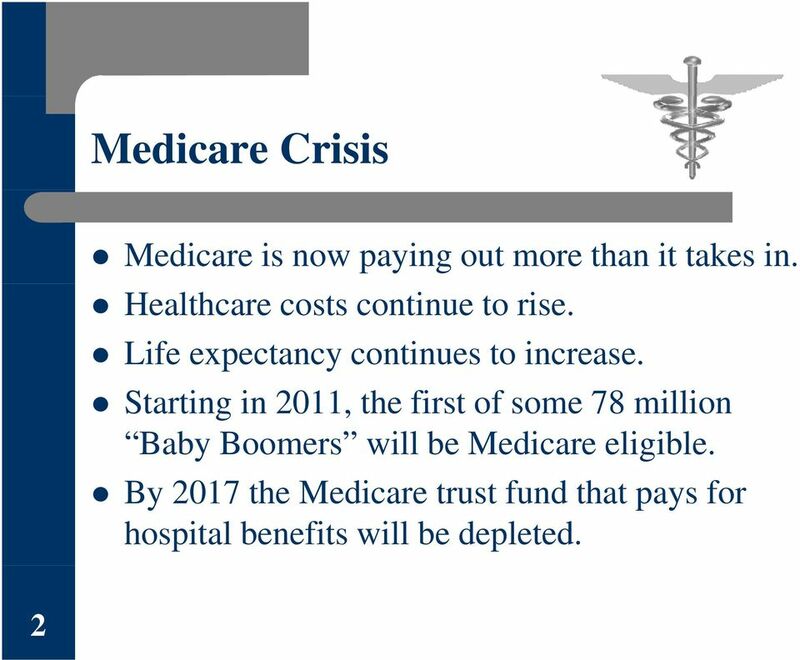 2) Who is to transmit this information to Medicare?